Gurney back on, he's got two overs left. Thirmanne completes his seventh ODI half-century from 89 deliveries (1x4, 1x6). It's not been particularly pretty, but he's doing the job for his side. Sri Lanka need 39 off 36 balls. Jordan to continue. Gurney is again in the action at third-man as Mathews' uppercut drops just short of him as he dives forward and runs away for four. Some sharp running between the wickets makes it 10 from the over in total, Mathews expertly using Jordan's extra pace to work the ball around. Sri Lanka need 29 off 30 balls. 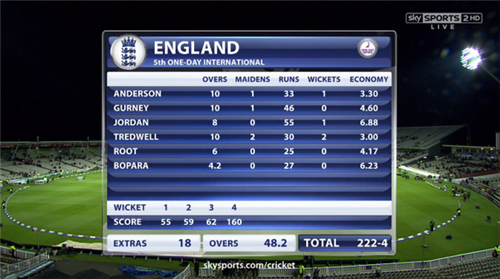 Sri Lanka target Gurney in his final over. Mathews advances and drives over mid-off for four and follows up by smashing another four over cover off the back foot. Gurney finishes with 0-46. Sri Lanka need 19 off 24 balls. Anderson back on for his final over. Anderson back on for his final over. 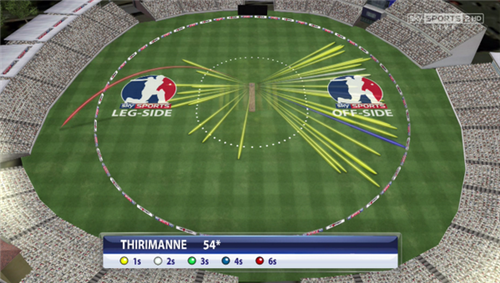 Thirimanne helps the first delivery for four to midwicket, it was too short and asking to be hit. Root makes a diving stop at cover point to save some runs after Thirimanne middles a square drive. Dropped! Anderson gets his right hand on a return drive from Thirimanne but doesn't hold on. Tough chance, high to his right. Anderson finishes with 1-33. Sri Lanka need 15 off 18 balls. Jordan can bowl the final two overs from this end (if it gets that far). Bopara will take the 49th over. Four singles are taken and then Mathews finds the boundary with an uppercut from the penultimate ball of Jordan's over. Mathews keeps the strike with a drop-and-run single on the off-side. Sri Lanka need 6 off 12 balls. Mathews hits consecutive boundaries off Bopara to open the 49th over. 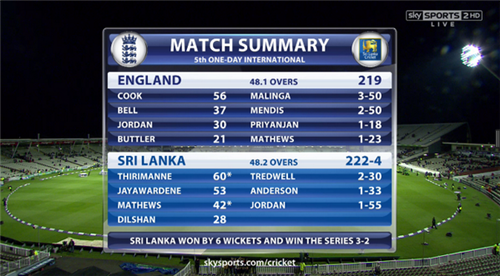 Sri Lanka win by six wickets with 10 balls to spare and take the series 3-2. 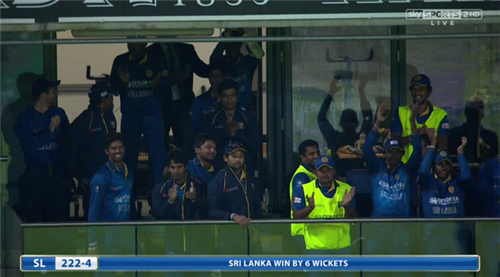 Congratulations @OfficialSLC !!! 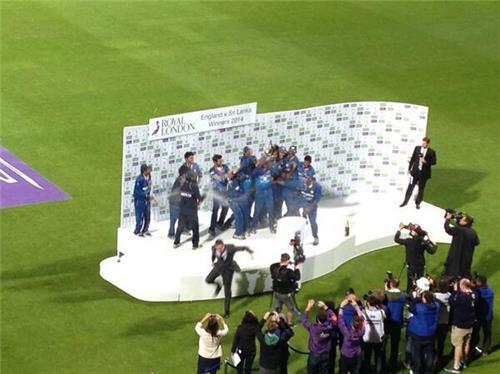 Superb chase..Well paced today and deserved winners of the series !!!! Cook: "We were 20/30 short. Everyone got in but no-one went on to get a hundred. Credit to Sri Lanka."